35mm engineered flush non-fire rated internal glazed door with cross directional oak veneer laid in a stiles and rails effect with 4 rectangular vision panels with Linea toughened glass. Supplied factory finished in clear satin lacquer. Available in standard imperial sizes with 10 years manufacturing guarantee. Manufactured in Spain. 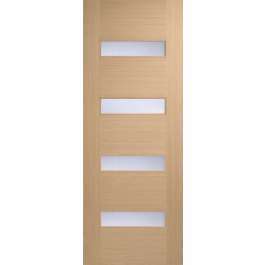 A contemporary internal oak door with a fluid elegant design, featuring cross directional veneer and 4 horizontal glass panels. This fully finished door is available in a range of models including FD30 fire and non-fire doors to closely match the style of the door. Special sized door service available - for prices and delivery times please contact our sales department. 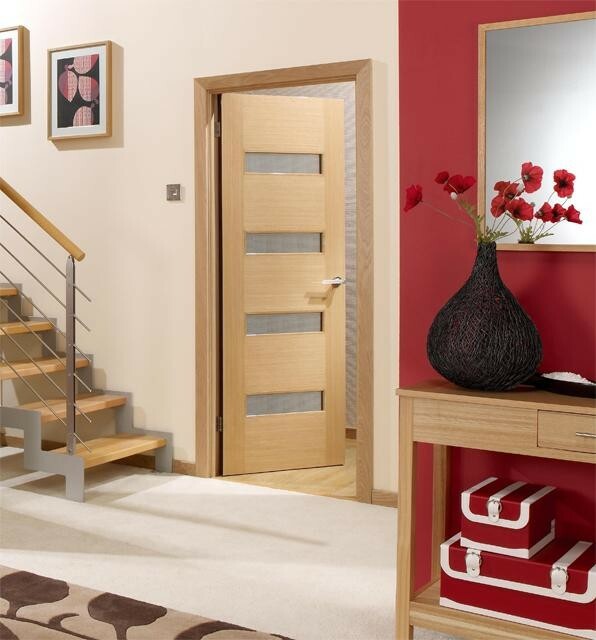 All standard doors and frames are delivered within 4-6 working days to mainland UK. Ironmongery is delivered in 1-2 days from order. Subject to stock availability. Terms and Conditions apply.